Known for his high values and discipline. He is the dynamic, flamboyant & a pillar for various accolades of Vel Tech group of Institutions. He works tirelessly toward student welfare. His efforts established collaboration with industries through MOUs for the purpose of student internships & Placements. His Orientation towards architecture & aesthetical design has always marked a niche. 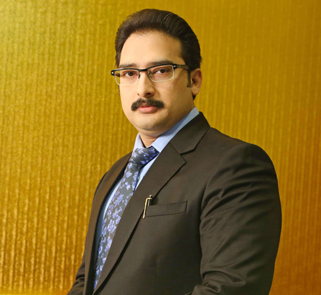 Since 2000, he has been The Director of Vel Tech group and with his deep commitment, dedication and hardwork, bringing many laurels which has contributed to the elevation of Vel Tech in its academic to corporate system. His concentration has paid rich dividends to Institution, faculty & student community. He has taken simultaneous measures to improve the attitude, aptitude, technical knowledge and skills of students to adequately respond to the employer’s expectation. His contribution in Placements are significant since the inception of Institution and his pioneering in the concepts of pool drive for recruitment purposes has enabled collaboration with top MNCs like TCS, Infosys, Wipro and so on. His humble beginning in placements has brought over 500 regular recruiters in Institution representing Core, IT, IT Enabled services etc.